The Black Scorpion (1957), a mid-grade sci-fi thriller, is one of several Warner Archive titles previously and incorrectly released 4:3 standard format but here reissued in 16:9 enhanced widescreen. That's good news insofar as these movies are now correctly formatted, but also not-so-good news because these reissues are on less stable DVD-Rs, manufactured-on-demand. In other words: one step forward, one step backward. The move also begs the obvious question: Why not simply reissue the title as a Blu-ray? For all the praise Warner Archive receives, much of it justly deserved, Warner Home Video generally has been a lot slower than most studios in getting its classic film library out on Blu-ray. On one hand they own more classic Hollywood titles than anyone else - not just the entire Warner Bros. catalog, but also all of RKO, nearly all of MGM, and most of Monogram/Allied Artists - and yet unlike other studios they've so far declined to sublicense any of their holdings to other labels like Twilight Time and Olive Films, labels that would surely jump at the chance were it offered. In the sci-fi realm, it's almost startling that, this far into Blu-ray's evolution, there are no Blu-rays of The Thing (from Another World) (1951), The Beast from 20,000 Fathoms (1953), Them! (1954), or, in the U.S., The Curse of Frankenstein (1957), all popular catalog titles. Of course, Warner Home Video hasn't released many even bigger titles to Blu-ray either: major MGM musicals, important film noir, Tarzan films, the Thin Man series, Andy Hardy, the MGM Marx Bros. titles, innumerable classics starring Humphrey Bogart, Bette Davis, James Cagney, etc. 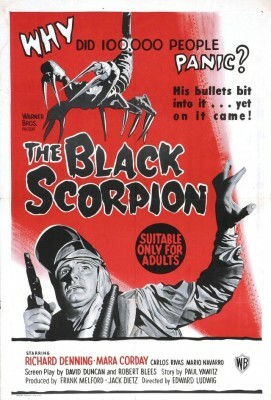 So perhaps it's not surprising that a film as minor as The Black Scorpion isn't exactly a top priority. The nearly 20-year-old King Kong (1933) enjoyed a shockingly successful rerelease in 1952, earning more money than most brand-new films. This didn't pass unnoticed, and when independent producers recycled and updated Kong's story for the low budget The Beast from 20,000 Fathoms (1953), Warner Bros. bought the film outright and shrewdly exploited it along the same lines. It cost just $210,000 to make yet earned about $5 million at the box office, a smash hit in those days. The biggest problems with The Black Scorpion are (1) that at 88 minutes it's a good 15 minutes too long; and, (2) a related complaint, that in imitating Them! 's mystery structure its script sorely tests the audience's patience. They know the monster is a giant black scorpion (in fact, the movie offers quite a large number of big, nasty-looking creatures), yet there's way too much stalling until we get to the "good stuff." As it turns out, the "good stuff" is really good, lively stop-motion animation supervised by King Kong's Willis O'Brien. Whether it's worth the long wait is another matter. Undoubtedly to save money, The Black Scorpion was filmed in Mexico. The story follows geologists Dr. Hank Scott (Richard Denning) and Dr. Arturo Ramos (Carlos Rivas) as they investigate the birth of a new volcano following a huge earthquake. Venturing into devastated rural areas, they are puzzled by unusual damage and inexplicable deaths. In one small village they stumble upon a completely totaled police car, the dead body of a policeman (his face frozen in fear) and a seemingly abandoned infant, but no other villagers, living or dead. After a lot of driving around in their jeep, helping thrown horseback rider and rancher Teresa Alvarez (Mara Corday) along the way, eventually they realize that the earthquake and volcano have unleashed eons-entombed prehistoric monsters. There's a bed of scorpions, but Hank and Arturo also encounter giant spiders and worms (inchworms, technically, but the term hardly seems apropos). Denning, Corday, and for that matter, Rivas, are all appealing actors, Denning and Corday were already sci-fi veterans (she for Tarantula and The Giant Claw, he for Creature from the Black Lagoon, Target Earth, Day the World Ended, and Creature with the Atom Brain), but the screenplay is bereft of any imagination or innovation. It's merely going through the motions. The monsters are something else. O'Brien didn't have enough time or money to make his stop-motion characters (mostly animated by Pete Petersen) as good as they might have been, but several of his sequences in the film are outstanding, much superior to the bulk of the film. Indeed, the film's special effects highlight, showing several train car-sized scorpions hiding under a bridge, chasing a truck, then plucking a lineman off a telephone pole and stinging him to death, several pincers from several scorpions all grabbing at him at once, was all shot as test footage for an as yet unnamed project. The screenplay was built around this test footage. In another marvelous set piece, Hank and Arturo are lowered into a deep cavern filled with various scorpions, as well as monsters played by armatures left over from the infamous deleted "spider pit" sequence in King Kong. Throughout these two scenes, the scorpions are unsettling to watch precisely because they scuttle about like real-world arachnids, only much, much larger. But the movie ran out of money, diminishing the effectiveness of the climax, where the biggest of the scorpions threatens Mexico City. Several shots feature not the three-dimensional model but simply empty travelling mattes (similar to some shots in Tarantula), "which results in what undoubtedly is the blackest scorpion of all time," notes genre historian Bill Warren. Several effects shots here also are used more than once, adding to the cheap look. Warners added a big, drooling prop head of a scorpion to insert into these sequences. The head only vaguely matches the features of the stop-motion models and looks more than a bit silly. Almost perversely, it's this outrageous prop featured prominently in most of the film's advertising. Unlike the 2003 DVD, Warner Archive's reissue of The Black Scorpion is in its original 1.85:1 aspect ratio, with 16:9 enhancement. This is mostly a big improvement, though the film still has odd scattered shots unaccountably beat all to hell, as if the negative cutter mislaid shots here and there and was forced to insert workprint material instead. The Dolby Digital mono is fine, and the disc is region-free. This reissue includes all of the extras from the original DVD: "Stop Motion Masters," a featurette with stop-motion master Ray Harryhausen; test footage of the "Las Vegas Monster" and "Beetlemen"; stop-motion clips from Irwin Allen's The Animal World (1956), featuring effects by O'Brien and Harryhausen; and an extensive trailer gallery. I'm glad Warner Archive is reissuing this and other titles in their correct, original aspect ratios, but like others I'd rather see this and, more urgently, other Warner-owned catalog titles, out on Blu-ray instead. Still, for what it is, The Black Scorpion is Recommended.